Quick Answer: George R. R. Martin based much of the War of the Five Kings on the events of the Wars of the Roses. The wars were a series of battles between the Lancasters and Yorks, two noble families in British rule, both of whom believed they deserved the crown. A number of the major players in these conflicts were adapted into characters vying for power in similar ways in the books and on the television series. We’re all glad we don’t live in a world quite as violent and terrifying as the one depicted in Game of Thrones (2011 - ). Few of its people are granted the pleasure of a comfortable death, wars and struggle are constant realities, and there’s always the looming threat that an army of ice zombies could wipe out civilization. 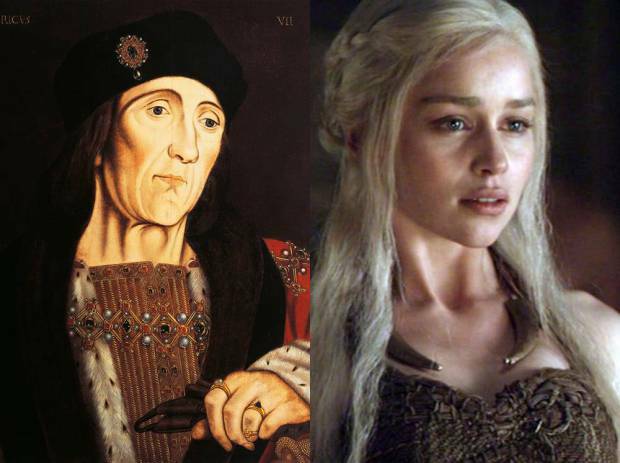 The funny thing is, a lot of Game of Thrones is based on real-world history. It’s been a long time since The Wars of the Roses, the series of battles which ultimately led to the installation of Henry Tudor as king. In the late 15th century, decades of feuding over control of the English throne took place between two squabbling families of prominence. The conflict originated after The Hundred Years’ War, which created social and financial troubles that, combined with the eventual mental problems suffered by Henry VI, revived an interest in Richard, Duke of York’s claim to the kingship. The families involved were the Lancasters and the Yorks, and if it isn’t yet clear which two fictional Game of Thrones families they are adapted into, you need to get caught up on Westerosi politics. 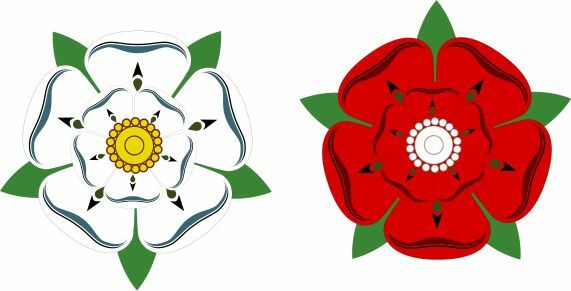 The Lancasters were represented by a red rose; The Yorks, a white one. Even today, the counties of Lancashire and Yorkshire associate with these colors. Neither family had dragons or ice zombies or crippled sons with magical abilities to bend time and control animals, but the story of the War of the Roses does include plenty of throne rivalry, weak monarchs, shifting loyalties, murdered princes, scheming protectors of the realm, and even assistance from outsiders across the “narrow sea” -- here, the English Channel. Much like its fictionalized counterpart, The War of the Roses was a convoluted and brutally violent series of events. Its Battle of Towton in 1461 is considered the bloodiest battle ever fought on English soil, so much so that archeologists are still uncovering human remains from the fight today. Thus, the Wars of the Roses served as the basis for much of the series’ drama, particularly as it applies to the conflicts between the Lannisters (and by extension, Baratheons), Starks, and the original War of the Five Kings. George R.R. Martin was able to take these events and put them at the nucleus of his incredible fantasy world, expanding outward with a woven tale that uses history as its core. Historically, the death of King Edward III in 1377 kicked off the drama. Edward’s oldest son was already dead, but his grandson, Richard II, was ten years old and became the king before Edward III’s three other surviving sons, skipping a generation and creating numerous claims to the throne within the family and its offspring. This entitlement became particularly strong within the Lancaster family, descended from Edward’s third son, and the Yorks, descended from his fourth son. So far, this all sounds shockingly like the Baratheon family. Margaret was prone to persecuting anyone who threatened her position as Queen. 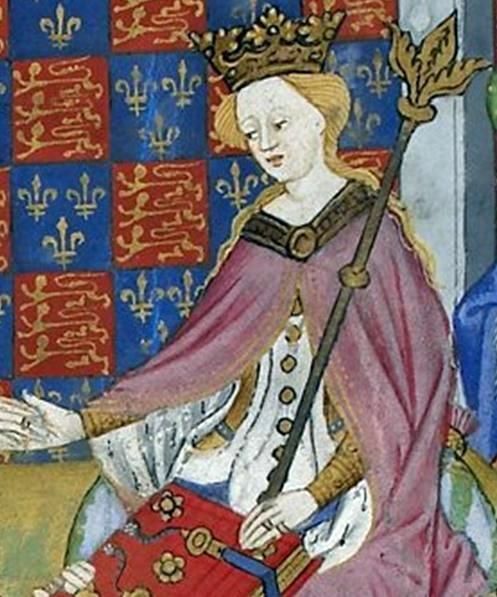 She also held a particularly strong distrust of Richard of York, who was a prominent figure in the family still harboring a claim to the throne. Richard of York, of course, translates into Ned Stark (Sean Bean) in the Game of Thrones narrative. York was Henry VI’s closest advisor, general, and trusted confidant. Naturally, the Queen did everything possible to keep York from being promoted or attaining too high a position, to which York protested and began openly fighting with the Lancasters. He was rewarded with banishment to Ireland. Meanwhile, the Queen’s malicious tactics and questionable alliances caused great distrust of active rule among the people. Richard of York eventually returned to the country and became Protector of England, the real-world equivalent of Hand of the King. Henry VI suffered a mental breakdown (providing inspiration for the idea of a “mad king”) and York was appointed regent in charge of the government. Unfortunately for York, Henry recovered from his addled mental state and soon reversed York’s position at the Queen’s request. Once again, York attacked with an army, was reinstated as Protector and secured his heir’s succession following Henry’s death. During battles with Margaret’s forces, York was killed along with one of his sons. 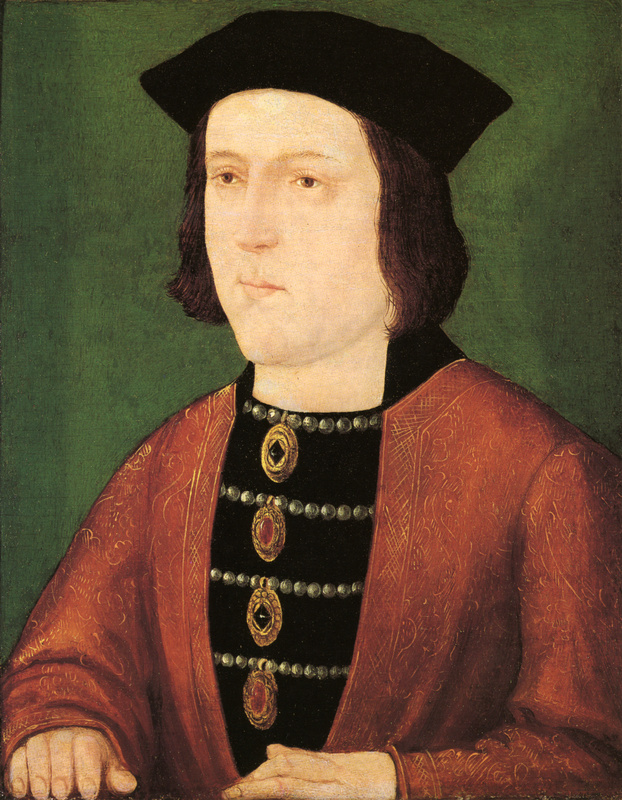 York’s other son, Edward, Earl of March, took the throne as Edward IV. Edward IV fought the Lancasters to frequent success, including the uber-bloody Battle of Towton mentioned earlier. The former King Henry VI was taken captive by Edward’s forces with Margaret and her son, Edward of Westminster. This allegedly cruel and high-tempered child serves as the inspiration for Joffrey (Jack Gleeson) in the Game of Thrones universe. Unfortunately, Edward IV’s success was undermined when he backed out of an arranged marriage with a French princess, secretly marrying the widow of a minor noble in her place. Now, it becomes clear that Edward IV was used as the foundation for Robb Stark (Richard Madden), and the ignored betrothal alienated many of Edward’s allies, especially the Earl of Warwick. The Earl (who inspired GoT's Lord Roose Bolton [Michael McElhatton]) turned many people against Edward IV and even briefly reinstated Henry VI as king. It didn’t stick, as Edward IV took the throne back, killed the Lancaster prince, and Henry soon died in a tower where Edward was holding him prisoner. It’s likely that his execution was ordered by Edward to prevent any further contest to his power from Edward’s loyalists. Edward reigned without much further uprising until 1483, when he passed away. The violence continued. Edward had a 12 year-old son due to succeed, but Edward’s younger brother Richard III declared that the boy did not deserve the crown on the pretext that he was the product of his father’s secret and inappropriate marriage. Richard III took the crown and imprisoned Edward’s children, becoming the basis for Stannis Baratheon (Stephen Dillane). The princes soon disappeared. Two years later, a figure from across the English Channel challenged Richard III’s reign. Henry Tudor, a direct descendant of the first Duke of Lancaster, was raised in exile after his father’s death. Game of Thrones also knows of a character directly descended from royalty who was raised in exile after their father’s death: Daenerys Targaryen (Emilia Clarke). Henry Tudor won support of the York forces, raised an army in France, crossed the English Channel, and defeated Richard’s forces. He married Elizabeth of York, the older sister of the princes Richard III made disappear, securing the crown as Henry VII. This linked the Lancaster and York families for the first time, ending the War of the Roses. The Tudor house went on to rule until 1603. This also means that if Game of Thrones follows history’s suit, Daenerys and Jon Snow (Kit Harington) may have a future together. Oh, the beautiful children! Beyond the War of the Roses, Martin draws on other histories for different groups within the story. The Dothraki are very reminiscent of the 13th and 14th century Mongol Empire, from their proclivity towards being horselords to the operation of the Khalasar. They even sent their widows back to a “headquarters” to live out their days when husbands have fallen. It is rumored they even poured molten liquid (historically, silver) onto someone’s head, reminiscent of Viserys Targaryen’s (Harry Lloyd) “golden crown” murder by Khal Drogo (Jason Momoa). The infamous “Red Wedding” is based on a combination of the Black Dinner and the Glencoe Massacre. The Wall is based on Hadrian’s Wall. Even the name Westeros is stylized after Wester Ross, a region of territory in the North West Highlands of Scotland. The list goes on. Much of Game of Thrones and its source novels are taken from history, with Martin’s wondrous fiction woven around them as they blend into one massive, incredible story, and it all started with The Wars of the Roses.